Tea has long been believed by traditional Chinese medicine to have special healing powers. Tea contains over 4000 chemicals, some of which may be beneficial for human health. The cardiovascular benefits ascribed to green and black tea are largely believed to be due to the effect of flavonoids of which there are many classes. Most have focused on the catechins and flavonols such as quercetin. The main dietary sources of flavonols include onions, apples, broccoli, tea and red wine. This is interesting because many of these high flavonol foods are also believed to be very healthy. An apple a day, for example, is purported to keep the doctor away. Red wine drinking has been associated with increased health and longevity. One cup of tea (2gm dry tea leaves) provides 150-200 mg of flavonoids. Since total flavonoid intake is usually less than 1000 gm per day, drinking 2-3 cups of tea will provide the majority of these flavonoid compounds. In green tea, the main flavonoids are the colourless and water soluble catechins that contribute to some of the bitterness and astringency of green tea. One cup of green tea contains 90-100 mg of catechins (more if cold brewed – see here). Black tea is fermented, and during this process, much of the catechins are oxidized to theaflavins. This meta-analysis looked at the relationship between dietary flavonoids intake and risk of heart disease. 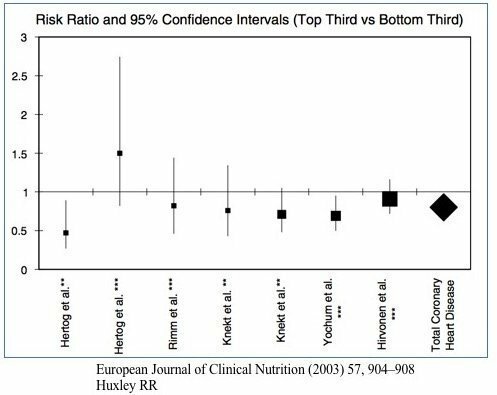 Comparing the top third of flavonoids intake to the lowest, there is a 20% reduction in heart disease across 7 studies. Flavonoids may reduce heart disease due to its beneficial effect on the endothelium-the layer of cells that separates the blood from the wall of the artery. This single layer of cells is the only thing that separates the quickly flowing blood and the static blood vessel underneath and is crucial for health and disease. Any breach of this thin layer will expose the underlying blood vessel wall and trigger off an inflammatory reaction that produces atherosclerosis, the underlying process of heart attacks and strokes also called ‘hardening of the arteries’. 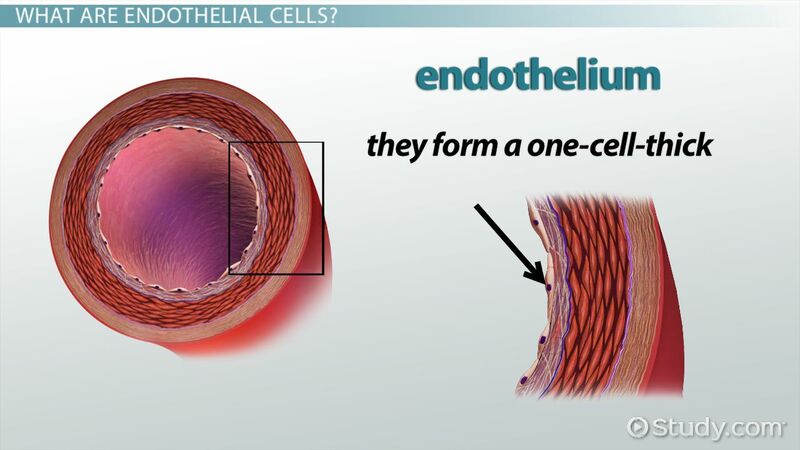 When the endothelium is breached, platelets form a clot which can sometimes cause blockage of the flow of blood in the blood vessel. This starves the underlying tissue of blood and can cause cell death. In the heart, it is called a heart attack. In the brain, it is called a stroke. In the legs, it is called peripheral vascular disease. In all cases, it is the same underlying damage to blood vessels and blood clots. This is partially why the blood thinner aspirin is used as a prophylactic against heart attacks. Maintenance of normal endothelial function is crucial for human health. Endothelial function may be measured by ultrasound to see if blood vessels react normally in a test called flow mediated dilatation. A number of these studies have been performed to investigate the effects of black or green tea and at least 4 human studies shows significant benefits in both normal and diabetic populations. Higher doses of black tea produce greater benefits. Similar benefits have also been noted for flavonoids derived from chocolate, but less consistently for red wine. Flavonoids enhance the effect of nitric oxide (NO) a key molecule to relax blood vessels. Improved endothelial function translates into lower blood pressure, a key risk factor for heart disease. Many studies show the anti-oxidant effect of flavonoids in vitro, and this is felt to be one of the key reasons for tea’s healthy persona. High blood pressure (hypertension) is also called the silent killer because it increases risk of heart disease and stroke, and yet there are few or no symptoms. The identification and successful drug treatment of hypertension has prevented thousands of heart attacks and strokes in recent decades. A blood pressure of 130/80 is considered normal currently. When I started medical school in 1992, I was taught that normal blood pressure was 100 + age, so a 70 year man should expect a blood pressure of 170. Traditional Chinese medicine believes that tea drinking reduces blood pressure and modern studies confirm. 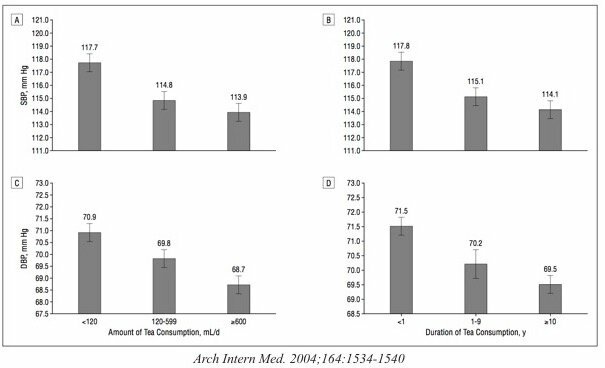 In a Norweigan study, adult men and women in the Oppland county were screened from 1976-1978, and when the same cohort was checked 12 years later researchers found a strong consistent relationship between tea consumption and hypertension. Blood pressure drops steadily with increasing tea drinking. Even though the magnitude of the drop in blood pressure is small, when this effect is multiplied by millions of men and women over decades, the overall effect is huge and the potential savings in both money and human suffering is massive. A Taiwanese study in the city of Tainan showed similar benefits. Subjects who drank more tea had lower blood pressures. The magnitude of benefit (about 4 mmHG) is similar to the previous Norwegian study. Interestingly, there was also an association with the duration of tea drinking, in that those who habitually drank tea for many years had lower blood pressures. There were some very important and impressive results from this 3 month study. The blood pressure was reduced by approximately 5 mmHG for both the systolic (top) and diastolic (bottom) number. That’s pretty much in line with the previous studies and a very large benefit overall if this can be maintained over years. The second statistically significant result (when the graph says NS – that means ‘Not Significant’. A P value less than 0.05 is significant) is the reduction in LDL (‘bad’ cholesterol), increase in HDL (‘good’ cholesterol’ and reduction in TG (triglycerides). Every part of the standard cholesterol panel improved. Whoa! That’s awesome. Yes, the magnitude of the change is small, but again, multiplied by millions of people means big benefits. Third, insulin went down. A lot. HOMA-IR is a measure of insulin resistance and this, too improved significantly. Since hyperinsulinemia and insulin resistance are huge risk factors for heart disease and stroke, this too, is a major finding. Fourth, markers of inflammation were significantly improved. CRP is a marker of inflammation, and high levels are a marker for future risk of disease Tumor Necrosis Factor (TNF) is also improved. 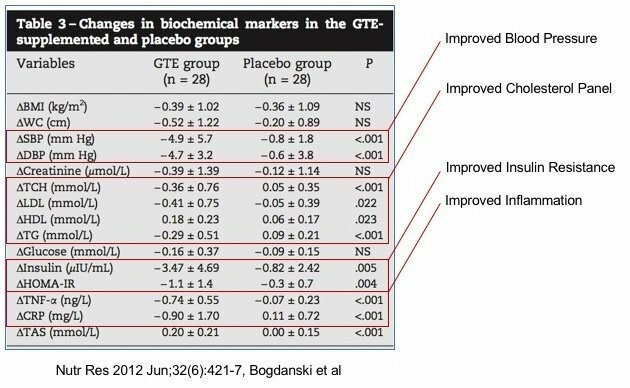 The important thing is that these benefits are all proven in a randomized trial where patients did not know if they were getting GTE or placebo. Also, all these benefits are delivered with essentially no side effects. Green tea is a natural product that has been drunk for thousands of years. Amazing. This would be expected to translate into real clinical benefits, and echoes some of the findings of the epidemiological studies such as the EPIC-NL. A large Dutch population study, called the European Prospective Investigation into Cancer and Nutrition (EPIC-NL) focused on the relationship with nutrition and cardiovascular disease. One sub-study focused specifically on both tea and coffee drinking. 37,514 participants were followed for over 13 years with food frequency questionnaires and their risk of heart disease and stroke were assessed. Those who drank moderate amounts of coffee had modest protection against heart disease. However, drinking more than 6 cups of coffee per day seemed to attenuate some of those benefits. This data is more or less in line with results from other studies indicating that moderate coffee drinking (3-4 cups) may have some potential benefits. A meta-analysis suggested a 13% risk reduction in heart disease. Tea, by contrast continued to show increased protection with greater usage. Those who drank more than 6 cups per day had a 36% reduction in incidence of heart disease. 78% of the tea drunk in the Netherlands is black tea, and only 4.6% is green tea, which has been more consistently associated with good health outcomes. This suggests that perhaps more benefits could have been found with green tea drinking but that is conjecture. Nevertheless, tea drinking has some strong evidence of improved cardiovascular health, and perhaps adding green tea to another ancient dietary tradition (fasting) as we do in our IDM membership program, may have even more benefits. How about posting something about your new book The Diabetes Code? The vasa vasorum might be more important in CVD. interesting that you joined in with the Subbotin theory. It makes sense when you look closely at how pathological changes develop in CAD. Intimal thickening, increased vasa vasorum, increased lipid deposition….lipid peroxidation and development of disease. Not sure if this excludes the proper place for endothelial function. However, Dr fung can quote paragraph and verse from conventional wisdom and be safe. Thank you for that excellent reference. As I see it, Dr. Fung’s approach to much of this is more epidemiology and statistically driven than based on pure physiology. And of course, Dr Fung is not working on a drug but rather on dietary recommendations to prevent or alleviate the issues. The question of finding out, and promoting, what helps or resolves the problem does not need to wait until the entire causal mechanism is understood. For that matter one could, to some extent, work back from what works to gain a greater or more productive understanding of the underlying mechanism. I was wondering about your take on tea and the thyroid. I have seen 6 different studies that have shown that tea is goitrogenic and can cause hypothyroidism. Do you have any concerns or advice regarding this? Nice article. In Japan for three years, I developed a taste for green tea. It is a pleasant habit. If i drink green tea i fill my sthomac upset and got headache. I wonder if herbal teas also have these same benefits. Hibiscus is said to lower blood pressure. My friend told me that. Hi, I’m about to joint your program! I’m overly sensitive to caffeine, which I discovered when I quit it temporarily because of a pounding heart at times. That has resolved thanks to supplementary magnesium, but I also found that without caffeine, I can avoid migraines for the most part. Sooooo, decaffeinated OK? I read in Consumer Labs that decaf green tea provides most of the same benefits with negligible amounts of caffeine. Comments? The problem with both tea and coffee is that they are difficult to drink on their own. Not impossible, but not easy. That’s why they are combined with sugar, milk, etc. which will of course add calories, possibly impede the beneficial effects, and of course increase insulin while attempting to fast. Both tea and coffee can also be addictive, with caffeine being the culprit although there might be others. It’s a matter of habit. I could almost never drink black coffee without sugar for feeling a too bitter-bland taste. Several months after cutting off added sugar and drinking black coffee on my fasting day in alternate-day fasting, I find the taste of sugar-free black coffee appealing. The tongue becomes more sensitive to the actual taste of coffee itself once it forgets the influence of added sugar on the taste. You can control your diabetes through the Loss weight & figure out your Body.